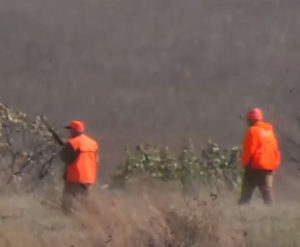 More than 50 veterans from all military branches took part in a special pheasant hunt in eastern Iowa Sunday. The “Heroes Hunt” pairs injured war vets with professional hunters and dogs. Wade Kinser, with Linn County Pheasants Forever, told KCRG-TV this was the fifth year for the event. “I think it’s important that they stay active, that they keep coming out,” Kinser said. “We’ve got guys in their 70s, one guy I think was almost 80-years-old. They’re not moving as fast, but they’re moving and that’s the main thing.” Marine Veteran Vincent Russo was injured while serving in Afghanistan and walks with a cane. He rode in an ATV during Sunday’s pheasant hunt. “When the dogs smell the bird and they point, then I just jump out, lean up against the ATV, and I fire,” Russo explained. Kinser told KCRG the veterans are welcome to take home any birds they kill, but the event is mostly about building camaraderie. “There are some rivalries between the services about who got more birds than the other, but it’s all friendly stuff,” Kinser said. Russo said, for him, hunting with other veterans is rejuvenating. “You see all these guys who are from so many different services, so many different age groups, and so many different wars, we can all sit here and tell stories and talk nonstop like we’ve known each other for 20 years,” Russo said.